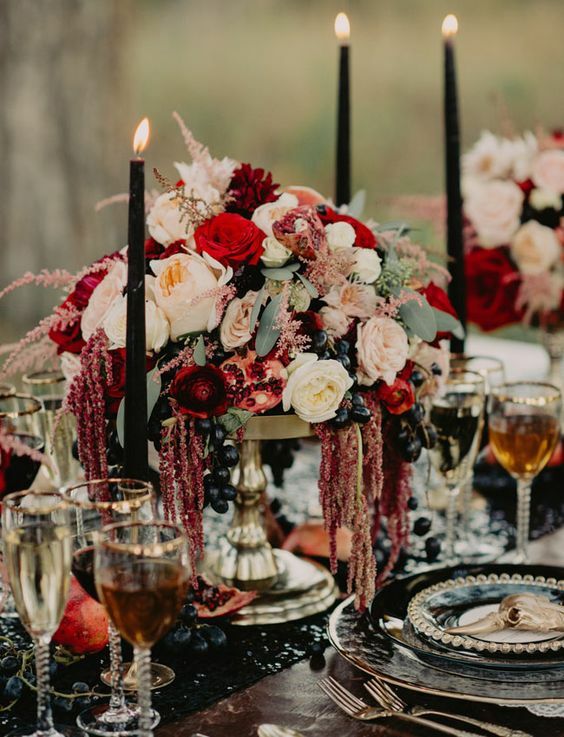 Halloween weddings aren’t only about red flowers and black dishes, they can be very stylish and refined without this combo and even without black, red and white your wedding may look as a Halloween one. 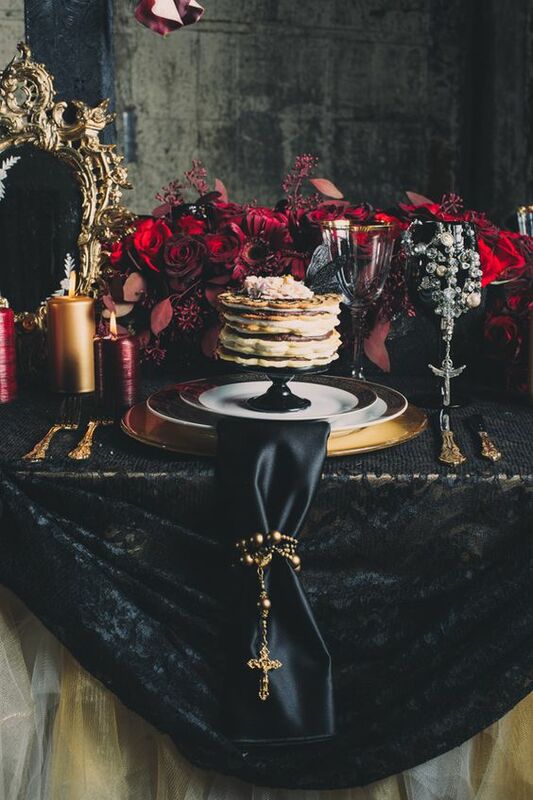 Wanna know how to throw a Halloween wedding with style? 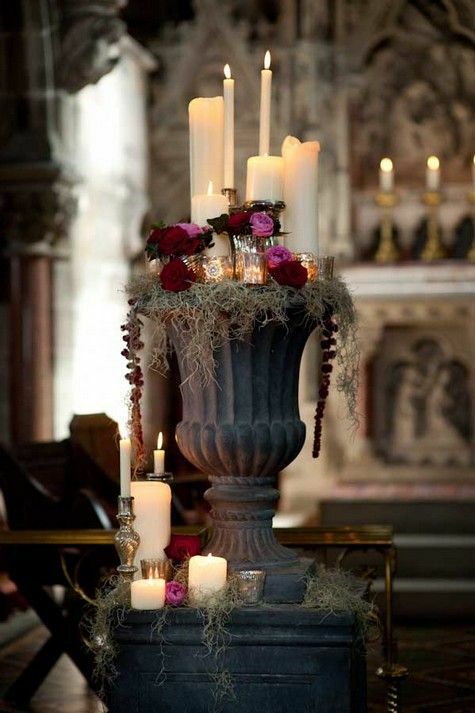 Candles are very often used at weddings, they create a romantic atmosphere and make any venue look very intimate and inviting. 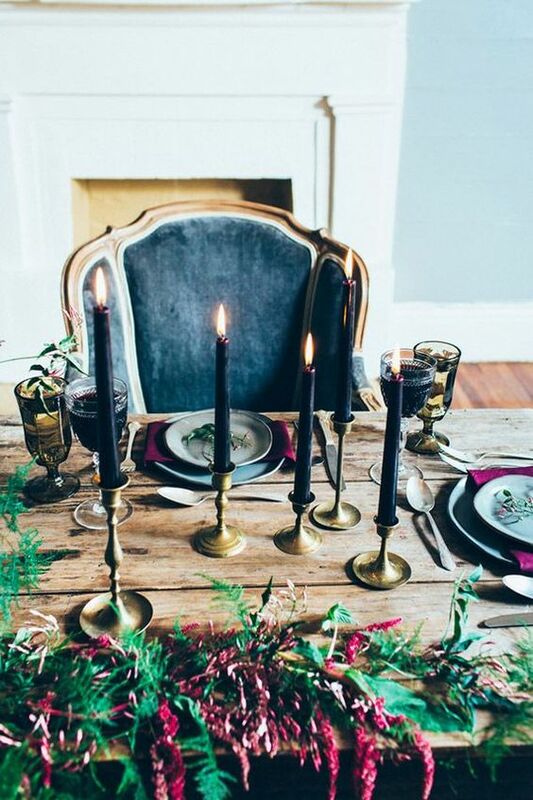 Use dark candles or black ones for your tablescape, place them in refined vintage candle holders, and they will create an ambience without any efforts. 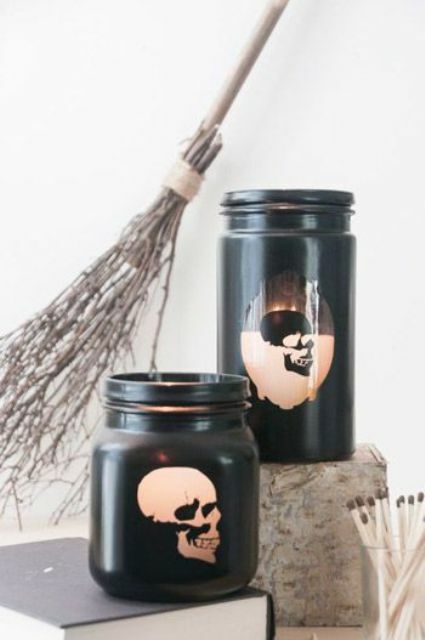 Take black dishes and chargers that will echo with your candles to get a sophisticated look. 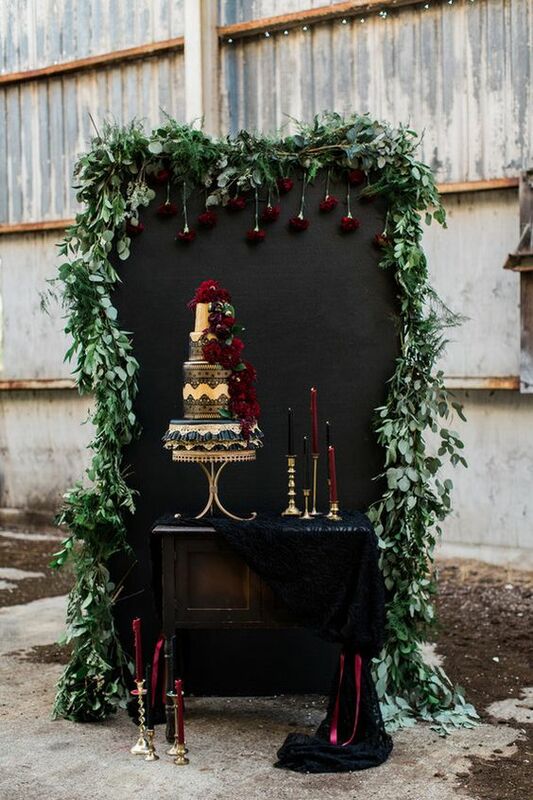 This is an indispensable part of any Halloween or gothic wedding. 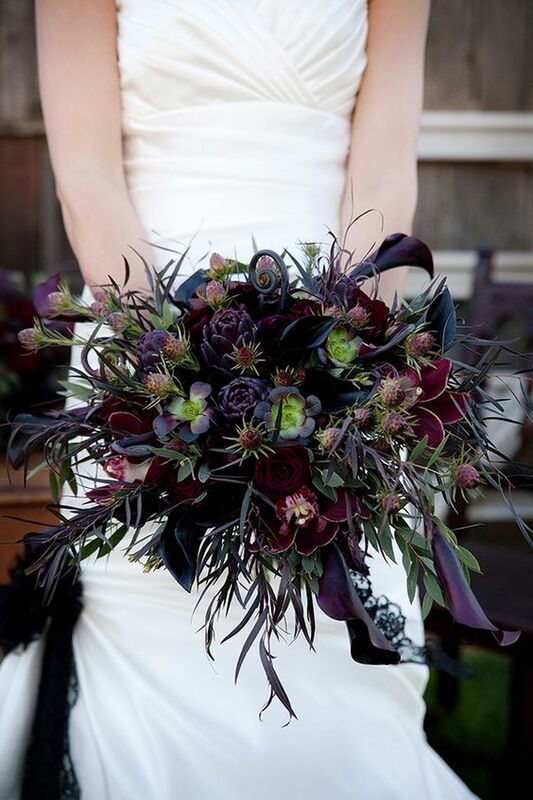 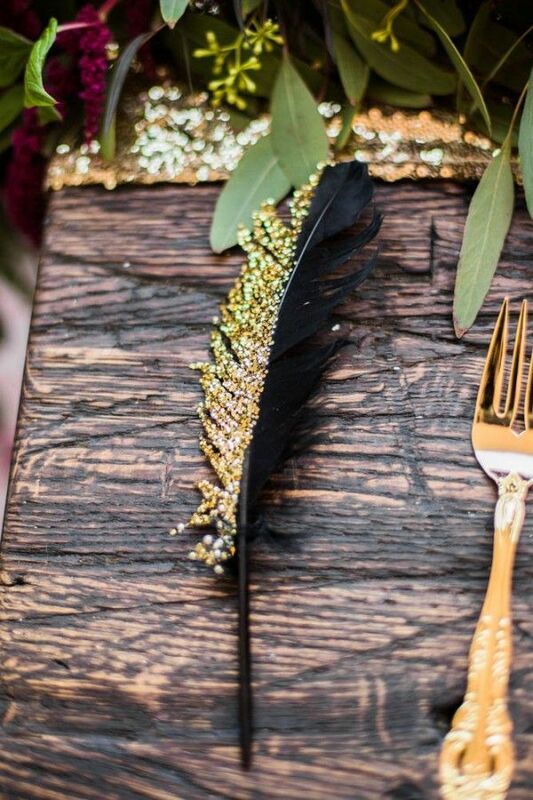 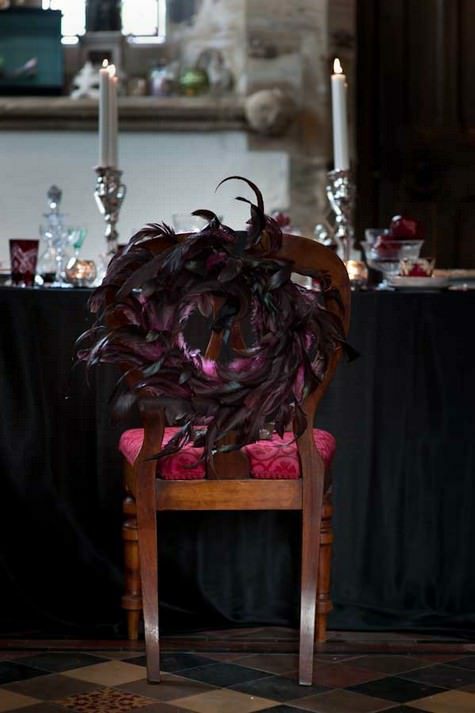 Dark flowers of your choice mixed with some black grapes and faux centipedes is a great idea for any table setting. 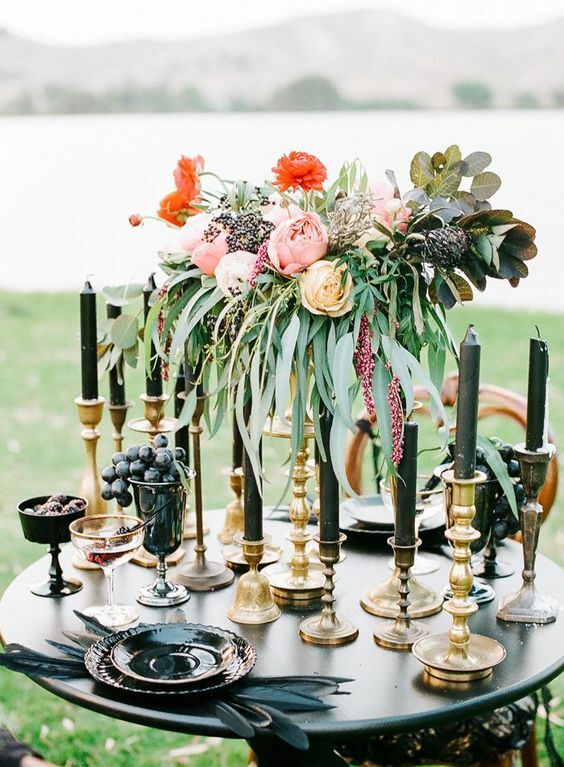 Take vintage bowls or urns, gilded ones will be perfect. 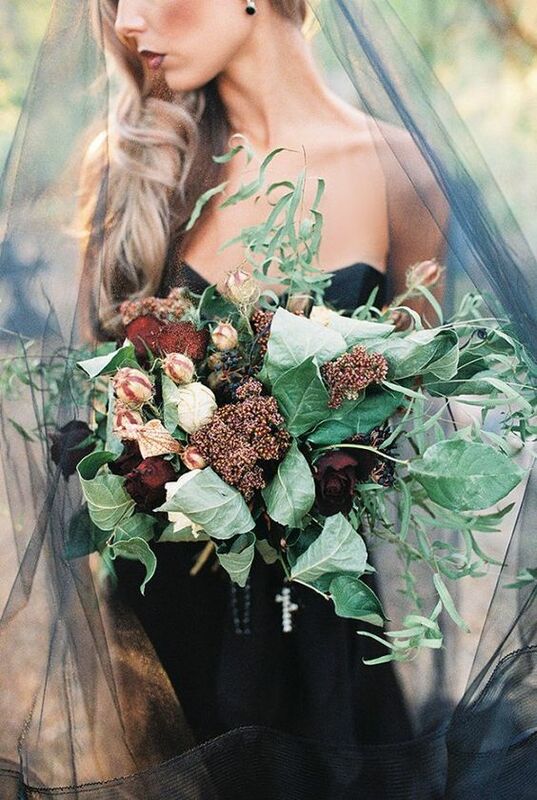 Rock a moody bridal bouquet especially if your wedding dress is white. 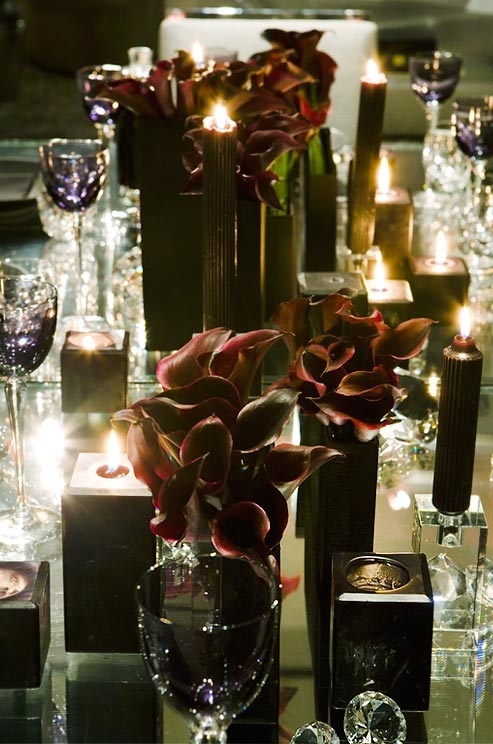 Dark callas will be a great idea for any tablescape and mauve roses will add decadent chic. 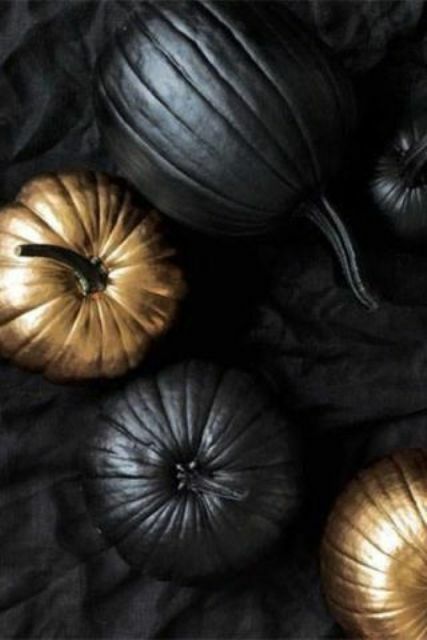 Pumpkins are one of the symbols of the fall, and for Halloween we have our own special ones, spooky and dark. 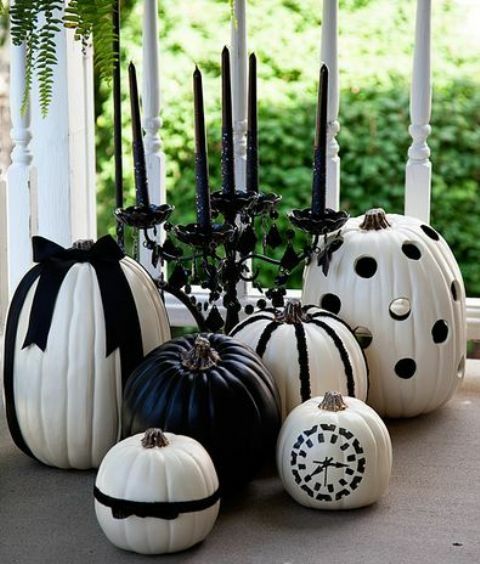 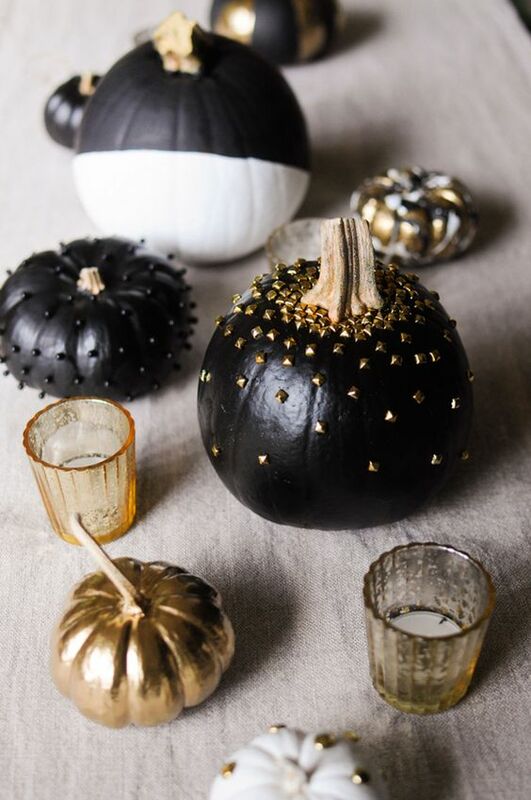 DIY some pumpkins: spray paint them black, white and gold and add metallic studs or ribbon. 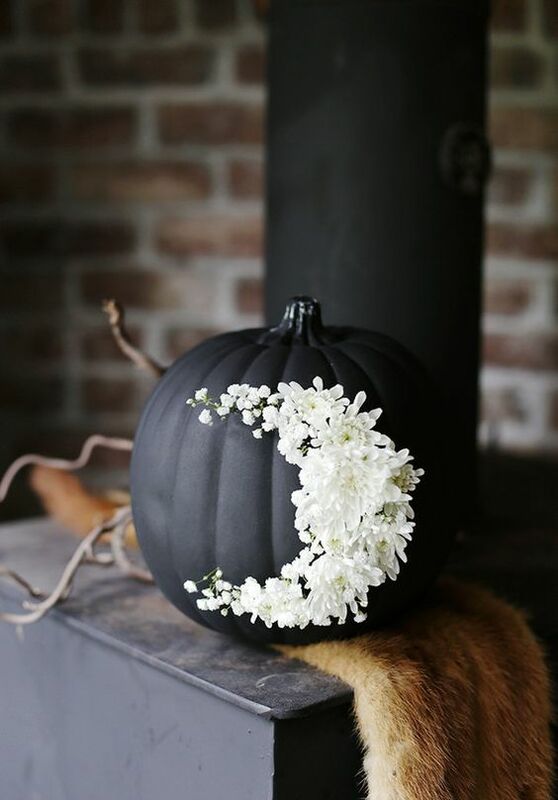 Such pumpkins are easy to make and can be brilliant and stylish decorations for any Halloween wedding. 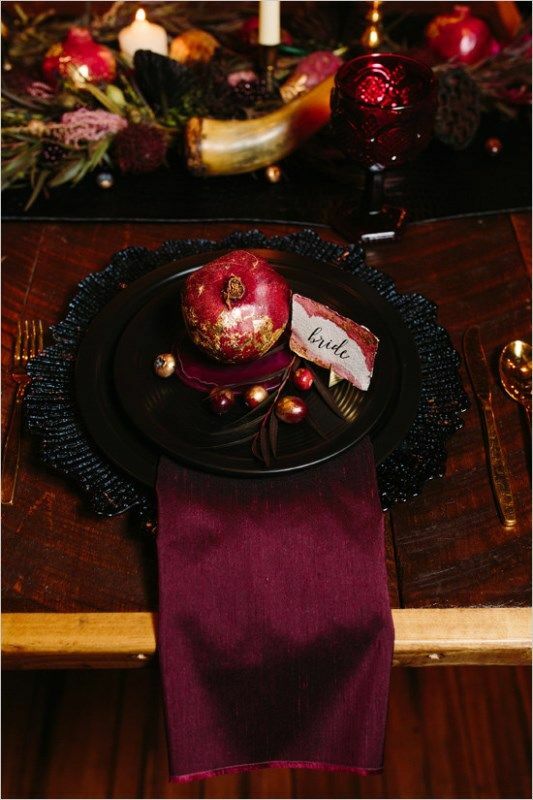 Create refined table settings in deep purple, red, black, gold, black and silver. 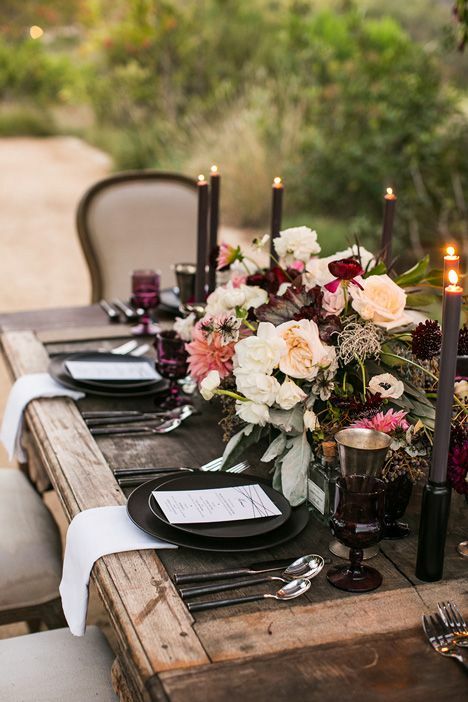 Black lace tablecloths, purple napkins, black chargers and dishes, refined gold tableware and lush florals will make your tablescape amazing. 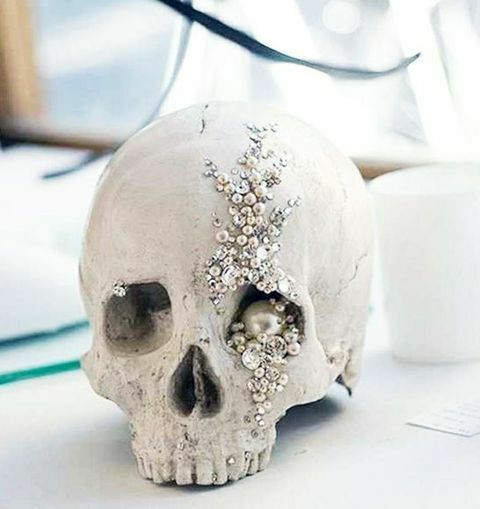 You can also add an animal skull or a human-styled one, and it can be decorated with beads and pearls. 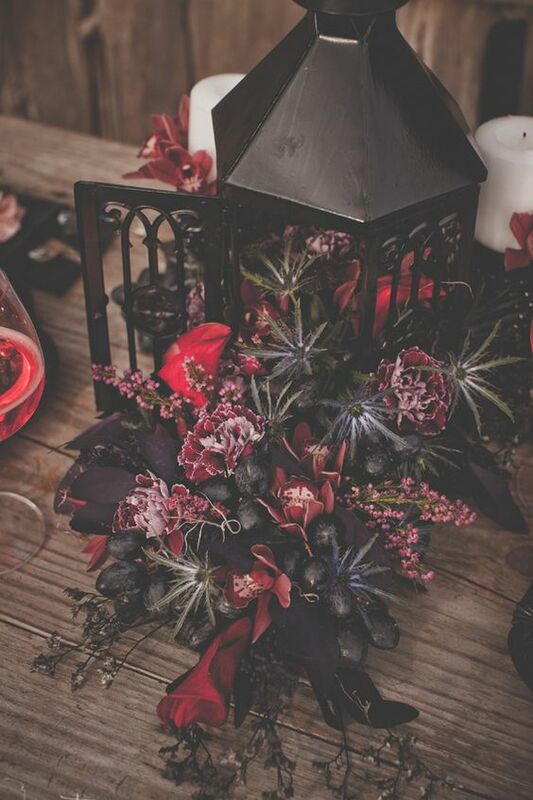 deep red florals, black lace tablecloth and a black napkin are perfect for a gothic wedding. 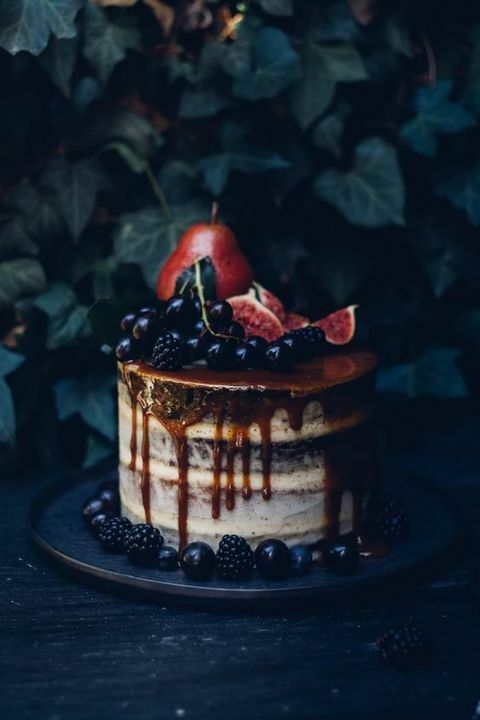 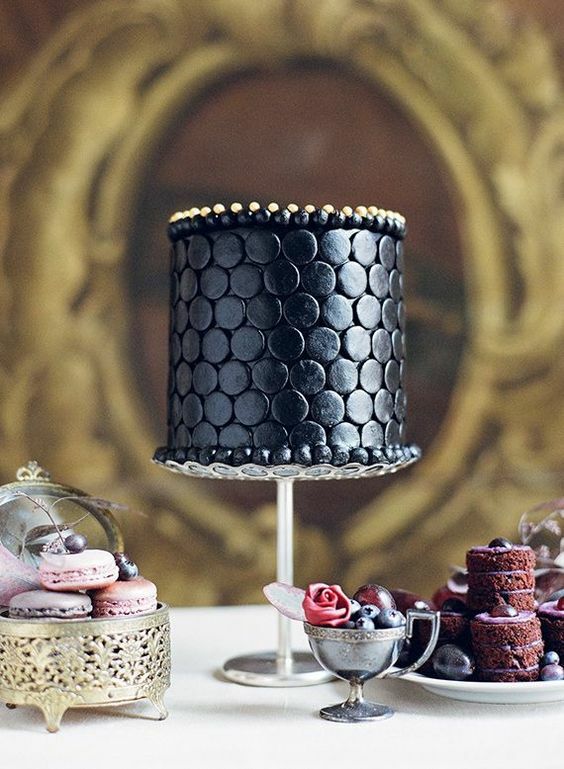 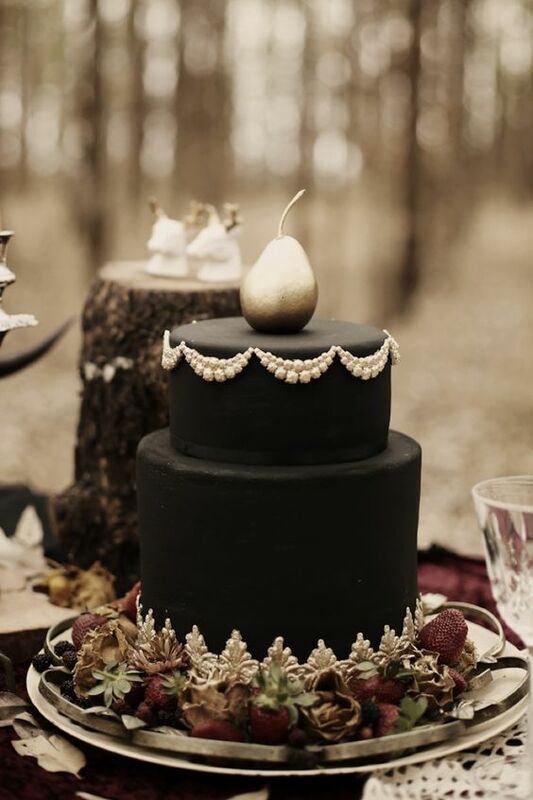 Your wedding cake is number one for setting a mood, order a black one decorated with lush flowers or gilded pears, or try a moody drip cake, as drip cakes are in trend now. 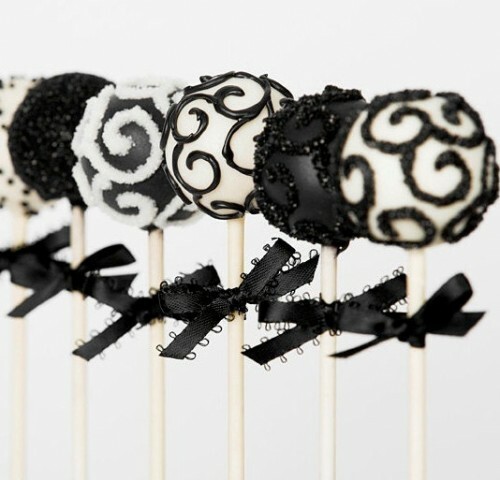 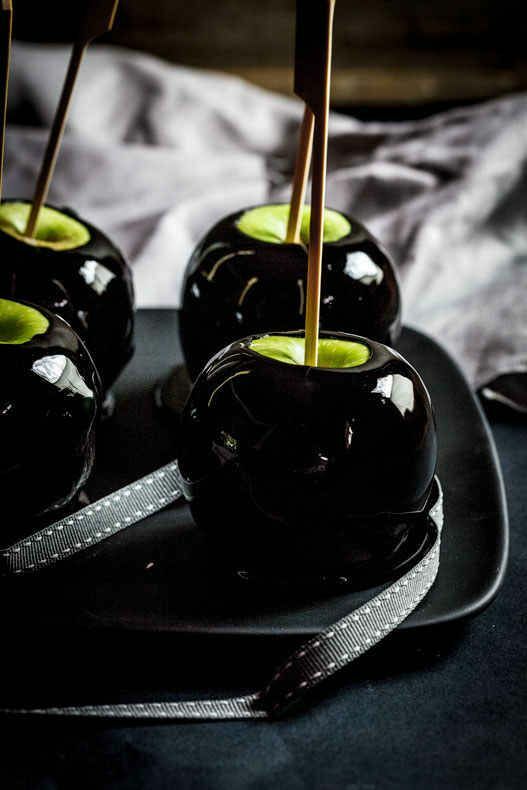 Black candy apples or stylish black and white pops can be a great idea for any refined Halloween wedding, and they can also be favors. 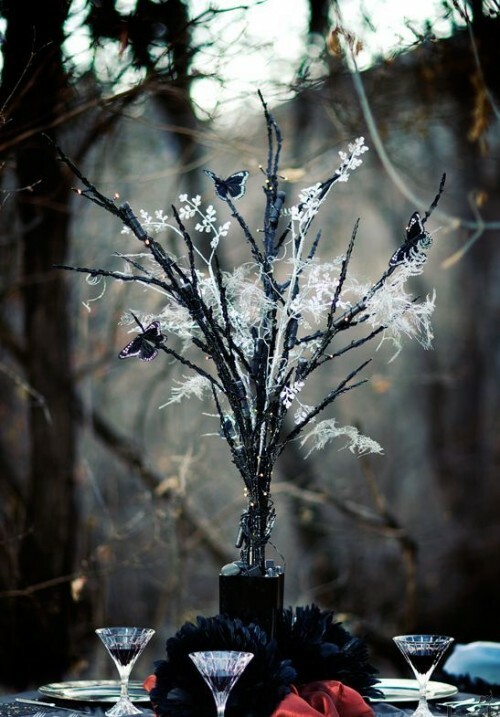 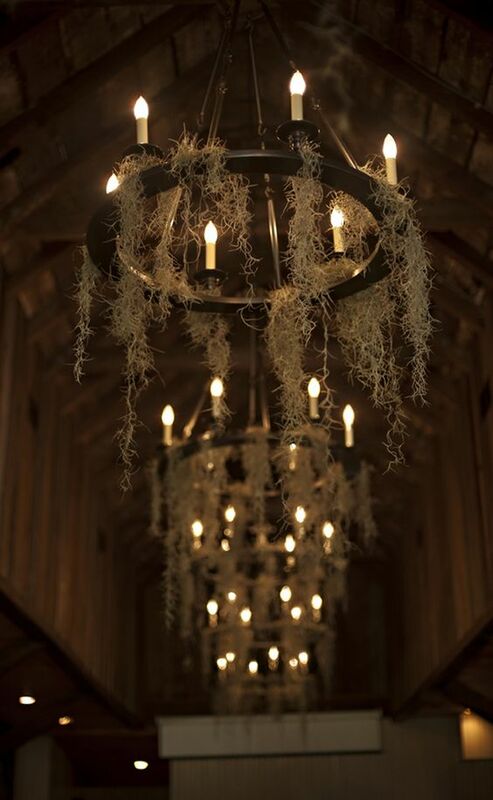 Create chandeliers with airplants hanging on them to imitate spider web, make black lanterns of mason jars using various skull decals, make purple and gilded feather and then turn them into garlands and wreaths. 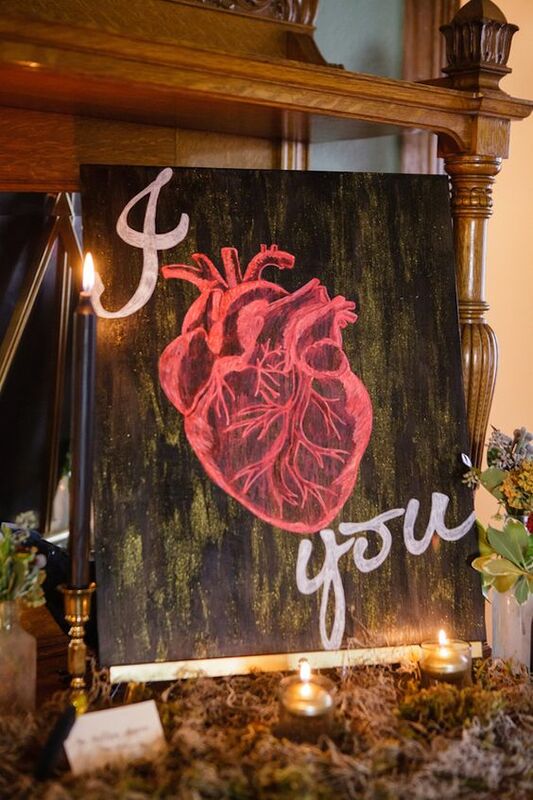 Design your wedding signs with various significant phrases, spooky but full of love. 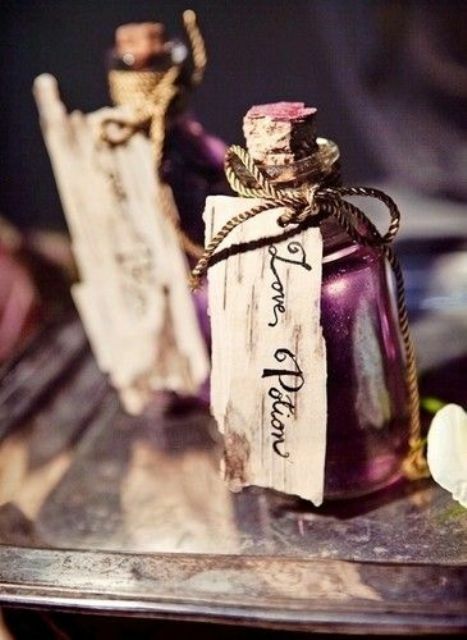 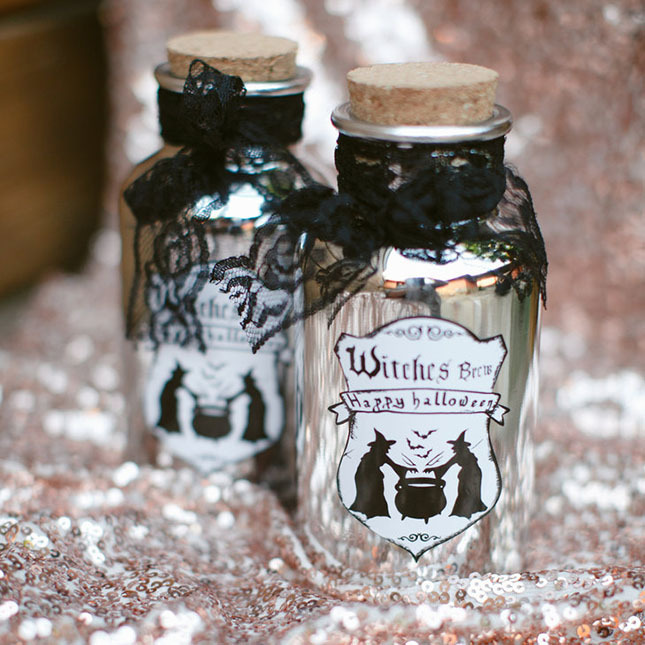 Your wedding favors may be witches’ brew or love potion but of course you’ll pour alocohol in the bottles. 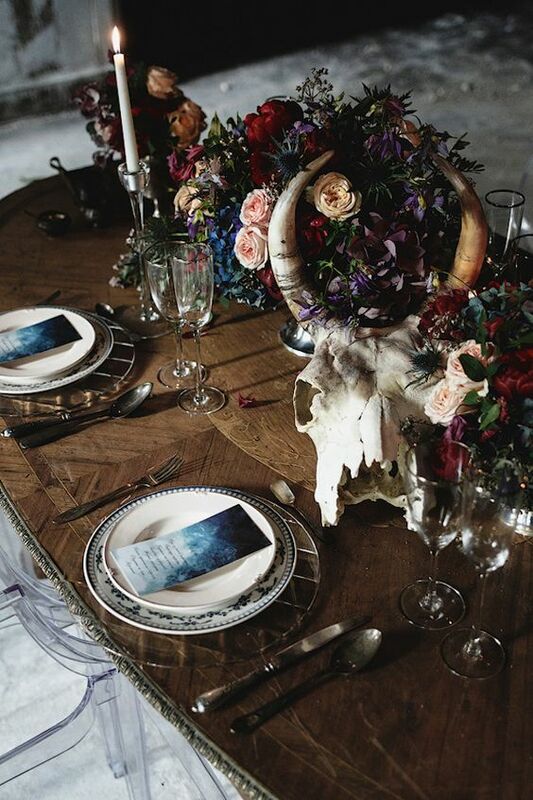 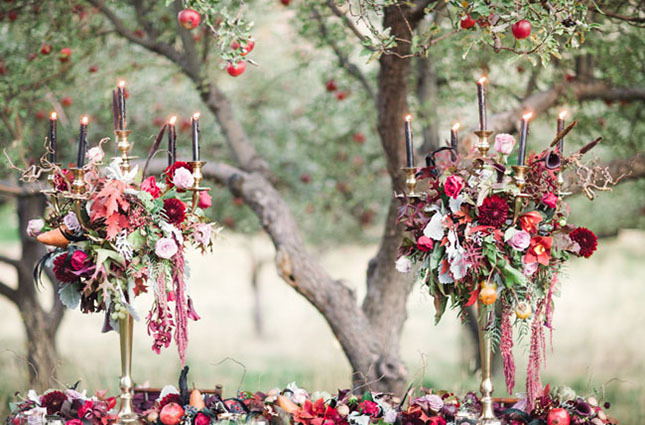 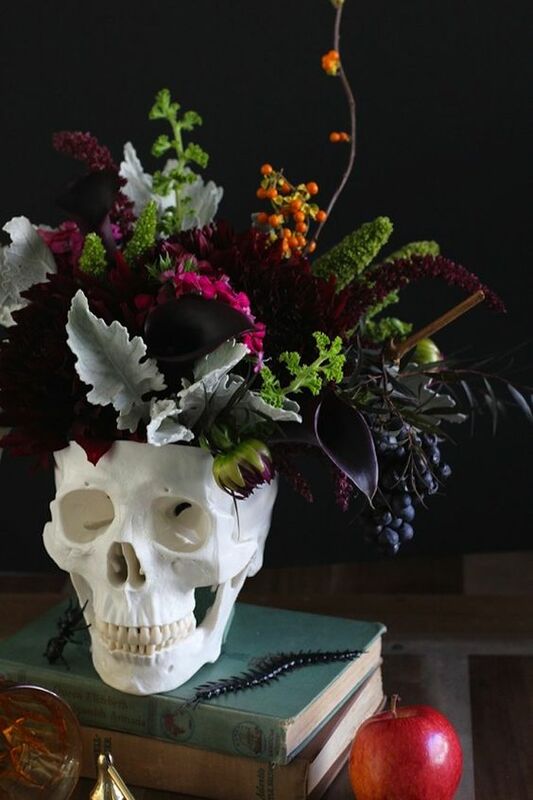 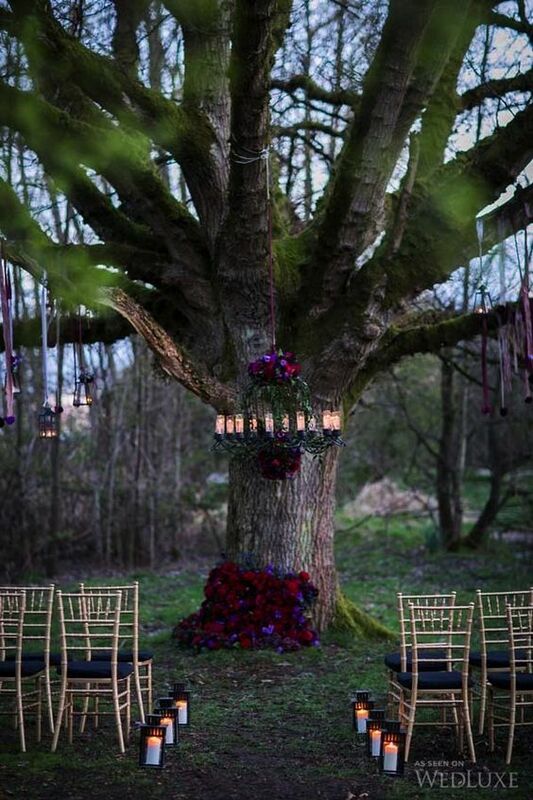 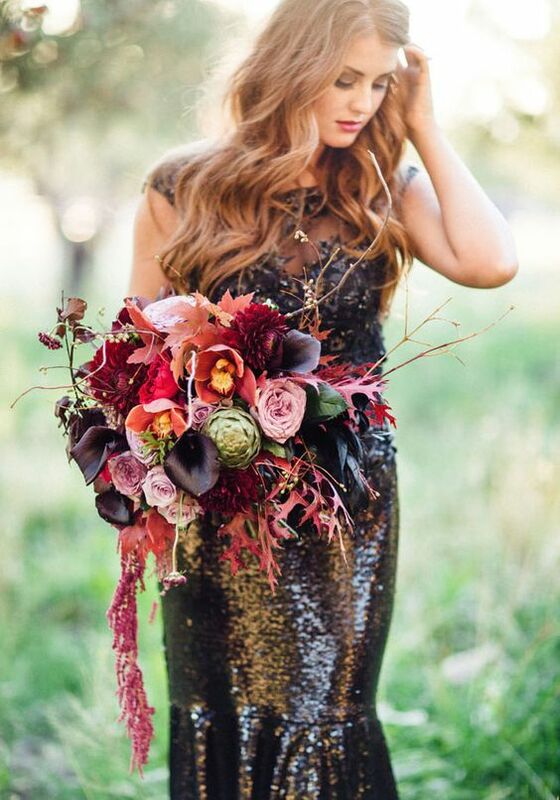 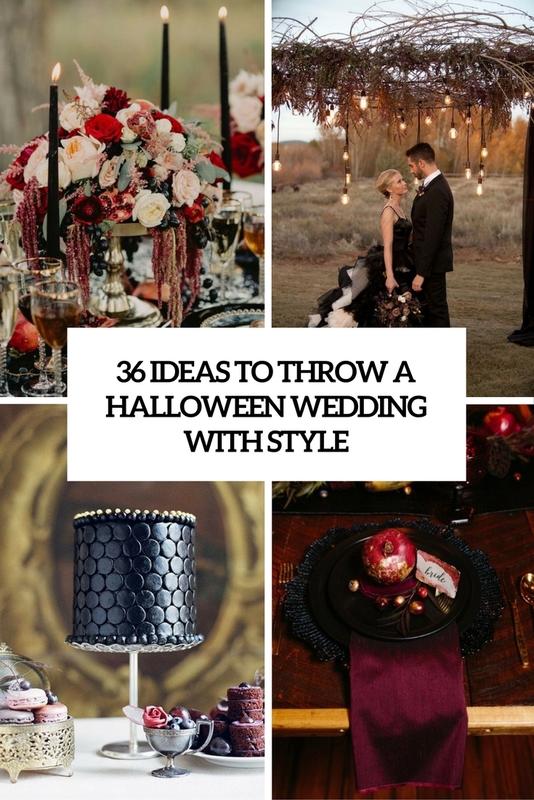 Find more ideas below and throw the most stylish Halloween wedding ever!